Myelofibrosis is a myeloproliferative neoplasm characterized by splenomegaly, progressive cytopenias, and transformation to acute myeloid leukemia. Several somatic mutations are pathogenetically responsible for this phenotype, the most important of which are JAK2, CALR, and MPL. However, the advent of high-throughput next-generation sequencing has identified multiple other molecular alterations that hold prognostic and possibly therapeutic potential. This tool is now commercially available, yet clinicians are frequently unfamiliar with how to interpret the results and incorporate them into the care of an individual patient. This review will describe mutations detected in myelofibrosis and discuss how to incorporate mutation information into risk stratification and therapeutic decision making for patients with myelofibrosis. High-throughput next-generation sequencing (NGS) to detect the presence of acquired somatic mutations holds the potential to not only enhance predictive abilities of clinical scoring systems, but also to personalize therapeutic approaches with mutation-directed targeted therapy.3 Technologic advancements in DNA sequencing have decreased the turnaround time while reducing costs, allowing for widespread commercial availability and expanding the application in routine clinical care.4 Therefore, it is important for clinicians to be familiar with the clinical applications of NGS in prognostication and therapeutic decision making when caring for patients with MF. We will first describe the most commonly mutated genes in MF and their prevalence. A thorough review of their prognostic potential including the integration of genomic data into current risk stratification tools will then be presented. Then we will describe the current utilization of mutational analysis in determining the treatment plan and discuss the development of molecularly based targeted therapy. Finally, we advocate for routine integration of mutational profiling into routine clinical practice. Aside from the main driver mutations, other somatic mutations also hold significant prognostic information. In a study of 879 patients with MF initiated in a European cohort and validated in a Mayo Clinic cohort, mutations involving ASXL1, SRSF2, and EZH2 were found to be associated with a shorter OS. However, only mutated ASXL1 remained independent of DIPSS, effectively identifying this mutation as a negative prognostic factor with potential to enhance established risk stratification systems. There was discrepancy between cohorts on the mutations found to be associated with leukemic transformation and shortened leukemiafree survival (LFS); however, the results of the study indicated that IDH1/IDH2, SRSF2, EZH2, and ASXLI mutations portend a poor prognosis. A separate study of 254 patients with MF shed further light on molecular-based risk stratification. Specifically, TN status was associated with a median overall survival of 2.5 years; however, patients harboring an ASXL1 mutation without a CALR mutation carried the worst prognosis, with a median overall survival of 2.3 years.25 Together, this identifies TN status and ASXL1-mutated/CALR wild-type as high-risk molecular subtypes of MF. 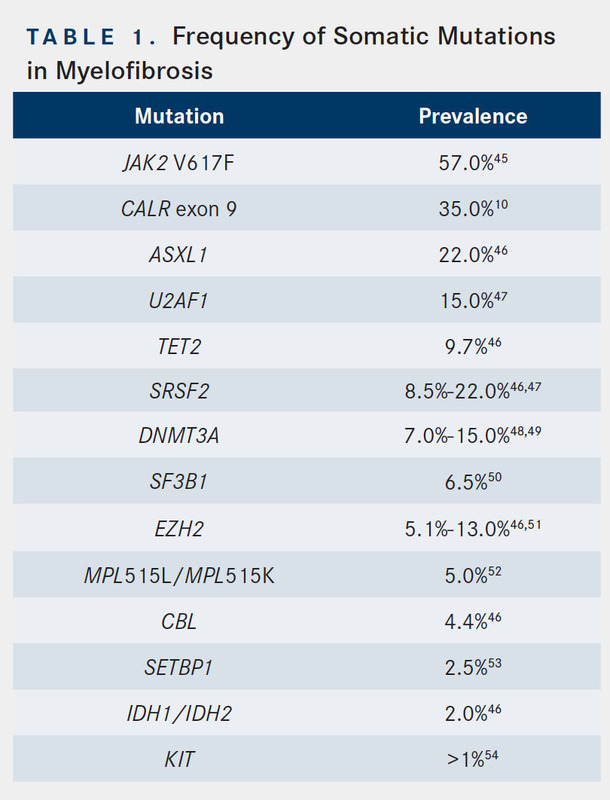 The number of high-risk mutations (ie, ASXL1, EZH2, SRSF2, and IDH1/IDH2) may also be important, as demonstrated in a study of 797 patients with PMF. The cohort with 2 or more high-risk mutations had a median OS of 2.6 years, compared with 7.0 years and 12.3 years, respectively, in the groups with 1 and 0 high-risk mutations. The presence of 2 or more mutations was also associated with a shorter LFS when compared with patients with no prognostically detrimental mutations.26 Other mutations may also share prognostic importance in MF. In a series including 197 patients with PV, ET, or PMF, the presence of mutated TP53 and TET2 were independently associated with shorter OS and shorter LFS.27 However, other studies have noted a neutral effect of TET2 on survival and leukemic transformation.28 Table 2 summarizes the current prognostic knowledge of these mutations in MF. Recently, several risk stratification tools have been developed that incorporate mutational information to refine prognostication and therefore improve treatment decision making. One such scoring system is the mutation-enhanced IPSS (MIPSS), which takes into account the mutational status of CALR, JAK2, and MPL; TN status; each single variable included in the IPSS; and additional key detrimental mutations (ASXL1, SRSF2, EZH2, and IDH1/IDH2) to create 4 distinct risk categories (Table 3). MIPSS performed better than IPSS in predicting survival (1611.6vs 1649.0) based on Akaike information criterion, which estimates the quality of a statistical model.29 A second novel prognostic model, the Genetic-based Prognostic Scoring System, takes into account age, karyotyping, and mutational information.30 However, the utility of these scoring systems in routine clinical practice remains unknown as they have not been prospectively validated. Treatment with ruxolitinib (Jakafi), a JAK1/JAK2 inhibitor, is the sole FDA-approved treatment for patients with MF. Ruxolitinib significantly reduces splenomegaly and improves symptom burden in patients with MF.31 Importantly, this clinical benefit accrues regardless of JAK2 mutational status or the presence of prognostically detrimental mutations (ASXL1, EZH2, SRSF2, IDH1/IDH2).32 However, the number of mutations present may predict spleen response with ruxolitinib treatment. This finding was noted in a posthoc analysis of 95 patients in a phase I/II trial of ruxolitinib. The number of mutations present was inversely correlated with spleen response; patients with ≤2 mutations had 9-fold higher odds of spleen response compared with those with ≥3 mutations. Additionally, patients with 3 or more of these high-risk mutations (ASXL1, EZH2, IDH1, or IDH2) had a shorter time to treatment discontinuation and shorter OS.33 Thus, the absence of JAK2 V617F does not preclude a patient from benefit with ruxolitinib treatment. However, high mutational burden (ie, more than 3 mutations) likely represents more aggressive disease and portends a worse outcome even with the use of ruxolitinib. NGS may therefore be a useful tool for prognostication as well as in the context of discussing the role of ruxolitinib versus consideration of clinical trial or hematopoietic stem cell transplantation (HSCT). Further validation is required in large prospective studies, but the results of these studies exemplify the potential for genomic data to refine risk stratification. It is evident that the presence of a poor prognostic mutation in a patient categorized as intermediate-1 or low-risk by DIPSS category likely warrants more aggressive treatment than the same DIPSS risk patient without such a high-risk mutation. To formalize this logic, it is imperative to adapt risk stratification to include genomic mutations. There has also been an attempt to investigate the role of early treatment with ruxolitinib in patients with MF with low-risk disease but high-risk mutations, using a clinical scoring system. The ReTHINK trial was a multicenter, double-blind, placebocontrolled, phase III study that set out to accrue 320 patients with MF who had a low symptom burden; nonpalpable or barely palpable spleen; and at least 1 of the following mutations: ASXL1, EZH2, SRSF2, and IDH1/IDH2.44 However, this trial was recently terminated because of poor accrual (NCT02598297). Mutational profiling has revolutionized oncologic care. In the case of MF, NGS has the potential to aid in prognostication through refined risk stratification and thereby assist in guiding treatment decisions for individual patients. Furthermore, similar to developments in the fields of other related myeloid malignancies and in oncology in general, movement toward molecular-based personalized therapies will become commonplace. This will drastically change the treatment paradigm for a molecularly heterogeneous population of patients. Genomic-based technology is commercially available and should be integrated into the routine care of patients with MF. As biotechnology and molecular insights increase in MF, it is imperative that clinicians continue to stay abreast of these advances to provide state-of-the-art care for their patients. Mesa RA, Li CY, Ketterling RP, et al. Leukemic transformation in myelofibrosis with myeloid metaplasia: a single-institution experience with 91 cases. Blood. 2005;105(3):973-977. Gangat N, Caramazza D, Vaidya R, et al. 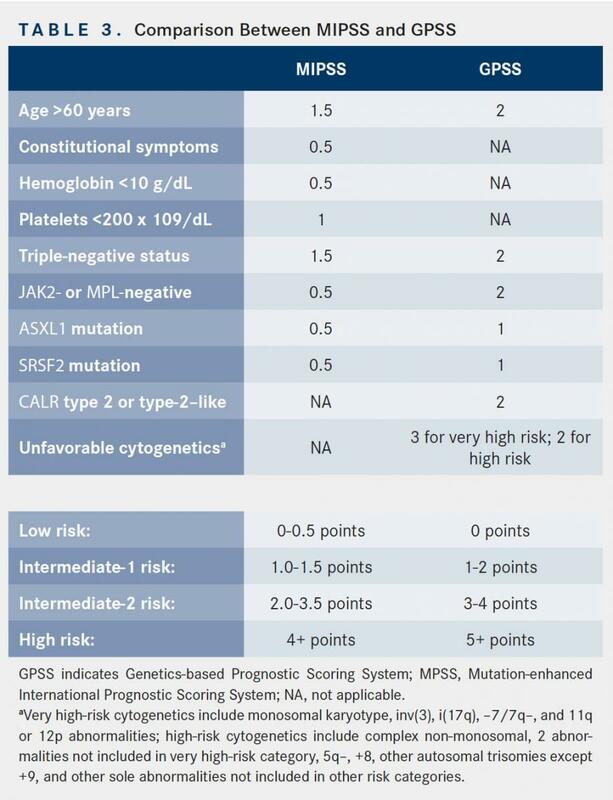 DIPSS plus: a refined Dynamic International Prognostic Scoring System for primary myelofibrosis that incorporates prognostic information from karyotype, platelet count, and transfusion status. J Clin Oncol. 2011;29(4):392-397. doi: 10.1200/JCO.2010.32.2446. Rampal R, Levine RL. A primer on genomic and epigenomic alterations in the myeloproliferative neoplasms. Best Pract Res Clin Haematol. 2014;27(2):83-93. doi: 10.1016/j.beha.2014.07.001. Rizzo JM, Buck MJ. Key principles and clinical applications of “next-generation” DNA sequencing. Cancer Prev Res (Phila). 2012;5(7):887-900. doi: 10.1158/1940- 6207.CAPR-11-0432. Levine RL, Loriaux M, Huntly BJ, et al. The JAK2V617F activating mutation occurs in chronic myelomonocytic leukemia and acute myeloid leukemia, but not in acute lymphoblastic leukemia or chronic lymphocytic leukemia. Blood. 2005;106(10):3377-3379. Dawson MA, Bannister AJ, Göttgens B, et al. JAK2 phosphorylates histone H3Y41 and excludes HP1alpha from chromatin. Nature. 2009;461(7265):819-822. doi: 10.1038/nature08448. Michalak M, Groenendyk J, Szabo E, et al. Calreticulin, a multi-process calciumbuffering chaperone of the endoplasmic reticulum. Biochem J. 2009;417(3):651- 666. doi: 10.1042/BJ20081847. Imai M, Araki M, Komatsu N. Somatic mutations of calreticulin in myeloproliferative neoplasms. Int J Hematol. 2017;105(6):743-747. doi: 10.1007/ s12185-017-2246-9. Gold LI, Eggleton P, Sweetwyne MT, et al. Calreticulin: non-endoplasmic reticulum functions in physiology and disease. FASEB J. 2010;24(3):665-683. doi: 10.1096/ fj.09-145482. Klampfl T, Gisslinger H, Harutyunyan AS, et al. Somatic mutations of calreticulin in myeloproliferative neoplasms. N Engl J Med. 2013;369(25):2379-2390. doi: 10.1056/NEJMoa1311347. Marty C, Pecquet C, Nivarthi H, et al. Calreticulin mutants in mice induce an MPLdependent thrombocytosis with frequent progression to myelofibrosis. Blood. 2016;127(10):1317-1324. doi: 10.1182/blood-2015-11-679571. Vainchenker W, Kralovics R. Genetic basis and molecular pathophysiology of classical myeloproliferative neoplasms. Blood. 2017;129(6):667-679. doi: 10.1182/blood-2016-10-695940. Carbuccia N, Murati A, Trouplin V, et al. Mutations of ASXL1 gene in myeloproliferative neoplasms. Leukemia. 2009;23(11):2183-2186. doi: 10.1038/ leu.2009.141. Simon JA, Lange CA. Roles of the EZH2 histone methyltransferase in cancer epigenetics. Mutat Res. 2008;647(1-2):21-29. doi: 10.1016/j. mrfmmm.2008.07.010. Katoh M. Functional and cancer genomics of ASXL family members. Br J Cancer. 2013;109(2):299-306. doi: 10.1038/bjc.2013.281. Abdel-Wahab O, Adli M, LaFave LM, et al. ASXL1 mutations promote myeloid transformation through loss of PRC2-mediated gene repression. Cancer Cell. 2012;22(2):180-193. doi: 10.1016/j.ccr.2012.06.032. Lehmann U, Bartels S, Hasemeier B, et al. SRSF2 mutation is present in the hypercellular and prefibrotic stage of primary myelofibrosis. Blood. 2013;121(19):4011-4012. doi: 10.1182/blood-2012-11-467662. Zhao S, Lin Y, Xu W, et al. Glioma-derived mutations in IDH1 dominantly inhibit IDH1 catalytic activity and induce HIF-1alpha. Science. 2009;324(5924):261-265. doi: 10.1126/science.1170944. Abbas S, Lugthart S, Kavelaars FG, et al. Acquired mutations in the genes encoding IDH1 and IDH2 both are recurrent aberrations in acute myeloid leukemia: prevalence and prognostic value. Blood. 2010;116(12):2122-2126. doi: 10.1182/blood-2009-11-250878. Cervantes F, Dupriez B, Pereira A, et al. New prognostic scoring system for primary myelofibrosis based on a study of the International Working Group for Myelofibrosis Research and Treatment. Blood. 2009;113(13):2895-2901. doi: 10.1182/blood-2008-07-170449. Passamonti F, Cervantes F, Vannucchi AM, et al. A dynamic prognostic model to predict survival in primary myelofibrosis: a study by the IWG-MRT (International Working Group for Myeloproliferative Neoplasms Research and Treatment). Blood. 2010;115(9):1703-1708. doi: 10.1182/blood-2009-09-245837. Tefferi A, Guglielmelli P, Larson DR, et al. Long-term survival and blast transformation in molecularly annotated essential thrombocythemia, polycythemia vera, and myelofibrosis. Blood. 2014;124(16):2507-2513; quiz 2615. doi: 10.1182/blood-2014-05-579136. Tefferi A, Lasho TL, Finke C, et al. Type 1 vs type 2 calreticulin mutations in primary myelofibrosis: differences in phenotype and prognostic impact. Leukemia. 2014;28(7):1568-1570. doi: 10.1038/leu.2014.83. Tefferi A, Lasho TL, Finke CM, et al. CALR vs JAK2 vs MPL-mutated or triplenegative myelofibrosis: clinical, cytogenetic and molecular comparisons. Leukemia. 2014;28(7):1472-1477. doi: 10.1038/leu.2014.3. Guglielmelli P, Lasho TL, Rotunno G, et al. The number of prognostically detrimental mutations and prognosis in primary myelofibrosis: an international study of 797 patients. Leukemia. 2014;28(9):1804-1810. doi: 10.1038/ leu.2014.76. Lundberg P, Karow A, Nienhold R, et al. Clonal evolution and clinical correlates of somatic mutations in myeloproliferative neoplasms. Blood. 2014;123(14):2220- 2228. doi: 10.1182/blood-2013-11-537167. Tefferi A, Pardanani A, Lim KH, et al. TET2 mutations and their clinical correlates in polycythemia vera, essential thrombocythemia and myelofibrosis. Leukemia. 2009;23(5):905-911. doi: 10.1038/leu.2009.47. Vannucchi AM, Guglielmelli P, Rotunno G, et al. Mutation-enhanced International Prognostic Scoring System (MIPSS) for primary myelofibrosis: an AGIMM & IWG-MRT project. Blood. 2014;124(21):405-405. bloodjournal.org/ content/124/21/405?sso-checked=true. Tefferi A, Guglielmelli P, Finke C, et al. Integration of mutations and karyotype towards a Genetics-based Prognostic Scoring System (GPSS) for primary myelofibrosis. Blood. 2014;124(21):406-406. bloodjournal.org/ content/124/21/406. Harrison C, Kiladjian JJ, Al-Ali HK, et al. JAK inhibition with ruxolitinib versus best available therapy for myelofibrosis. N Engl J Med. 2012;366(9):787-798. doi: 10.1056/NEJMoa1110556. Guglielmelli P, Biamonte F, Rotunno G, et al; COMFORT-II Investigators; Associazione Italiana per la Ricerca sul Cancro Gruppo Italiano Malattie Mieloproliferative (AGIMM) Investigators. Impact of mutational status on outcomes in myelofibrosis patients treated with ruxolitinib in the COMFORT-II study. Blood. 2014;123(14):2157-2160. doi: 10.1182/blood-2013-11-536557. Patel KP, Newberry KJ, Luthra R, et al. Correlation of mutation profile and response in patients with myelofibrosis treated with ruxolitinib. Blood. 2015;126(6):790-797. doi: 10.1182/blood-2015-03-633404. Tefferi A, Lasho TL, Abdel-Wahab O, et al. IDH1 and IDH2 mutation studies in 1473 patients with chronic-, fibrotic- or blast-phase essential thrombocythemia, polycythemia vera or myelofibrosis. Leukemia. 2010;24(7):1302-1309. doi: 10.1038/leu.2010.113. Yen K, Travins J, Wang F, et al. AG-221, a first-in-class therapy targeting acute myeloid leukemia harboring oncogenic IDH2 mutations. Cancer Discov. 2017;7(5):478-493. doi: 10.1158/2159-8290.CD-16-1034. Wang F, Travins J, DeLaBarre B, et al. Targeted inhibition of mutant IDH2 in leukemia cells induces cellular differentiation. Science. 2013;340(6132):622-626. doi: 10.1126/science.1234769. Stein EM, DiNardo CD, Pollyea DA, et al. Enasidenib in mutant IDH2 relapsed or refractory acute myeloid leukemia. Blood. 2017;130(6):722-731. doi: 10.1182/ blood-2017-04-779405. FDA granted regular approval to enasidenib for the treatment of relapsed or refractory AML [news release]. Silver Spring, MD: FDA; August 1, 2017. fda.gov/Drugs/ InformationOnDrugs/ApprovedDrugs/ucm569482.htm. Accessed April 6, 2018. McKenney AS, Lau AN, Somasundara AVH, et al. JAK2/IDH-mutant-driven myeloproliferative neoplasm is sensitive to combined targeted inhibition. J Clin Invest. 2018;128(2):789-804. doi: 10.1172/JCI94516. Keyzner A, Han S, Shapiro S, et al. Outcome of allogeneic hematopoietic stem cell transplantation for patients with chronic and advanced phase myelofibrosis. Biol Blood Marrow Transplant. 2016;22(12):2180-2186. doi: 10.1016/j. bbmt.2016.08.029. Panagiota V, Thol F, Markus B, et al. Prognostic effect of calreticulin mutations in patients with myelofibrosis after allogeneic hematopoietic stem cell transplantation. Leukemia. 2014;28(7):1552-1555. doi: 10.1038/leu.2014.66. Alchalby H, Badbaran A, Zabelina T, et al. Impact of JAK2V617F mutation status, allele burden, and clearance after allogeneic stem cell transplantation for myelofibrosis. Blood. 2010;116(18):3572-3581. doi: 10.1182/ blood-2009-12-260588. Kroger N, Panagiota V, Badbaran A, et al. Impact of molecular genetics on outcome in myelofibrosis patients after allogeneic stem cell transplantation. Biol Blood Marrow Transplant. 2017;23(7):1095-1101. doi: 10.1016/j.bbmt.2017.03.034. Kralovics R, Passamonti F, Buser AS, et al. A gain-of-function mutation of JAK2 in myeloproliferative disorders. N Engl J Med. 2005;352(17):1779-1790. Vannucchi AM, Lasho TL, Guglielmelli P, et al. Mutations and prognosis in primary myelofibrosis. Leukemia. 2013;27(9):1861-1869. doi: 10.1038/leu.2013.119. Martinez-Avilés L, Besses C, Alvarez-Larrán A, et al. Mutations in the RNA splicing machinery genes in myelofibrotic transformation of essential thrombocythaemia and polycythaemia vera. Br J Haematol. 2014;164(4):605-607. doi: 10.1111/bjh.12647. Stegelmann F, Bullinger L, Schlenk RF, et al. DNMT3A mutations in myeloproliferative neoplasms. Leukemia. 2011;25(7):1217-1219. doi: 10.1038/ leu.2011.77. Lasho TL, Finke CM, Hanson CA, et al. SF3B1 mutations in primary myelofibrosis: clinical, histopathology and genetic correlates among 155 patients. Leukemia. 2012;26(5):1135-1137. doi: 10.1038/leu.2011.320. Ernst T, Chase AJ, Score J, et al. Inactivating mutations of the histone methyltransferase gene EZH2 in myeloid disorders. Nat Genet. 2010;42(8):722- 726. doi: 10.1038/ng.621. Pardanani AD, Levine RL, Lasho T, et al. MPL515 mutations in myeloproliferative and other myeloid disorders: a study of 1182 patients. Blood. 2006;108(10):3472-3476. Laborde RR, Patnaik MM, Lasho TL, et al. SETBP1 mutations in 415 patients with primary myelofibrosis or chronic myelomonocytic leukemia: independent prognostic impact in CMML. Leukemia. 2013;27(10):2100-2102. doi: 10.1038/ leu.2013.97. Itzykson R, Kosmider O, Renneville A, et al. Prognostic score including gene mutations in chronic myelomonocytic leukemia. J Clin Oncol. 2013;31(19):2428- 2436. doi: 10.1200/JCO.2012.47.3314.